Nine years after the 9/11 attacks and two years into the Obama presidency, our nation is still flummoxed about what to do with captured terrorists. The Obama administration is stuck roughly where the Bush administration was, with little hope in sight. 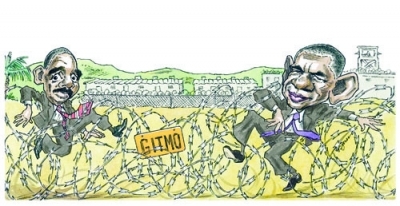 Guantánamo Bay has proved harder to close than the administration anticipated. Many terrorists in that prison are too dangerous to release and, for a variety of evidentiary reasons, cannot be brought to trial. Our allies have accepted fewer detainees than we would like. These men will thus have to continue in U.S. custody, but neither lawmakers nor the American people are keen on transferring them to the United States. Military commissions have not worked well, either, as recent difficulties with the trials of an alleged USS Cole bomber and a Canadian child soldier showed yet again. Commissions still pose novel legal and political issues; many in the military charged with operating them don’t like them; and they bring few legitimacy benefits, especially abroad, because they lower civilian justice standards and apply only to non-citizens. Civilian trials for terrorists have also proven difficult. They gathered disfavor when Attorney General Eric Holder said he would prosecute Khalid Sheik Muhammad and other alleged September 11 plotters in civilian court in Manhattan. Disfavor grew when the failed Christmas Day plotter, Umar Farouk Abdulmutallab, and the Times Square car-bomber, Faisal Shahzad, were placed in the civilian criminal system and read Miranda rights rather than detained and interrogated in the military system. The Bush administration prosecuted scores of terrorists in civilian court with little controversy. But the charge that the Obama administration is insufficiently tough on terrorists has made it harder for the current administration to try terrorists in civilian court. Difficulties with trials have left the Obama administration, like its predecessor, relying primarily on military detention without trial to hold terrorists. Courts have given their general blessing to military detention as a legitimate form of terrorist incapacitation. But military detention still raises hard legal questions, about which Congress has said practically nothing. As a result, unaccountable judges are making fateful detention decisions, demanding release of some who the administration thinks are dangerous terrorists. President Obama pledged to seek congressional clarity on detention but has yet to follow through. The abundant dysfunctions in our system for incapacitating terrorists have led to increased reliance on targeted killings and outsourced renditions. Neither tactic is optimal from an intelligence-gathering perspective. Meanwhile, Khalid Sheik Muhammad spent time in military detention and before a military commission before Holder said he would be tried in a civilian court. A year has come and gone, and we still don’t know where Muhammad’s fate will be determined. There is no silver bullet for this mess, but a few pragmatic steps can bring progress toward resolution. First, give up on closing the Guantánamo Bay facility. The administration long ago missed its initial one-year deadline. The symbolic benefits of closure have diminished significantly, because the substitute for detention without trial at the island prison is detention without trial inside the United States, with little if any change in legal rights. The main reason to close the facility is to fulfill a first-week presidential pledge that now, under different circumstances, is too costly. Many problems with trials go away if we simply deny terrorists their sought-after martyrdom. Second, acknowledge that military detention will remain the primary basis for holding terrorists, and strengthen the system. The president will eventually need Congress’s help, not only to put Guantánamo detentions on firmer footing but also to support the growing global fight against terrorists beyond traditional battlefields. The main legal foundation for targeting and detention in places such as Pakistan, Somalia, and Yemen is the September 2001 congressional authorization to deal with the 9/11 attacks. But as dangerous terrorists have ever-dimmer connections to September 11, the government is bumping up against the limits of what this authorization permits. Third, stop using military commissions, which are a good idea in theory but have for nine years proved unworkable in practice. Military detention and civilian trials provide adequate legal bases for terrorist incapacitation. Fourth, separate the legitimacy of civilian trials from the security of such trials. Much of the opposition to trying Muhammad in a New York civilian court was the potential for massive disruption in securing the downtown venue. Objections to civilian trials diminish if they are moved to more-remote places in the New York and Virginia districts where the crimes occurred. Fifth, do not seek the death penalty at trial. Many alleged terrorists plead guilty. Most of the hard legal and political problems in trials—including the use of classified information and coerced confessions—arise in the penalty phase, when defendants can seek and introduce any conceivably probative evidence. Many problems with terrorist trials go away if we simply deny terrorists their sought-after martyrdom. The charge that the Obama administration is not tough enough on terrorists has made it harder for the current administration to try terrorists in civilian court. These proposals, especially the last, are politically difficult. But not taking bold steps to resolve our terrorist-detention quandary will leave the nation in the increasingly unfortunate place it has been for nearly a decade. Reprinted by permission of the Washington Post. © 2010 Washington Post Co. All rights reserved. New from the Hoover Press is Skating on Stilts: Why We Aren’t Stopping Tomorrow’s Terrorism, by Stewart Baker. To order, call 800.935.2882 or visit www.hooverpress.org.